What’s this picture? Any guesses? 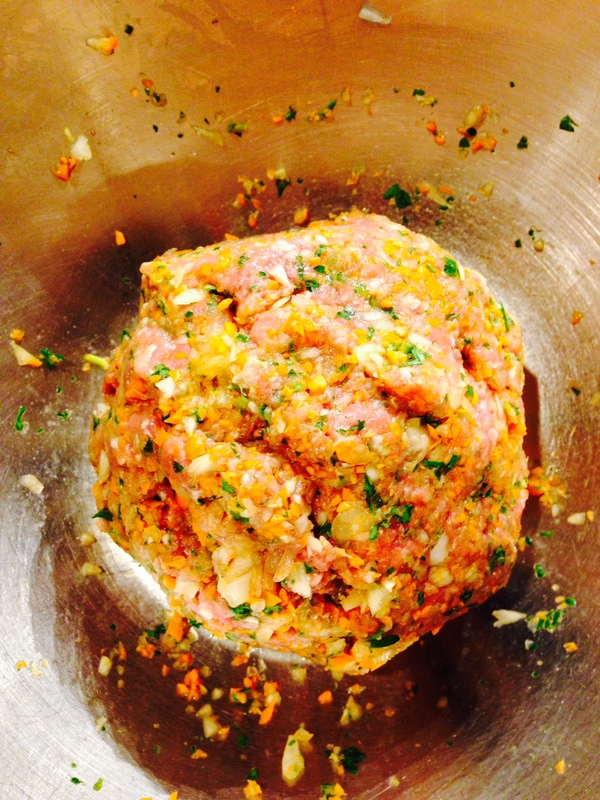 It shows the makings for meatballs. 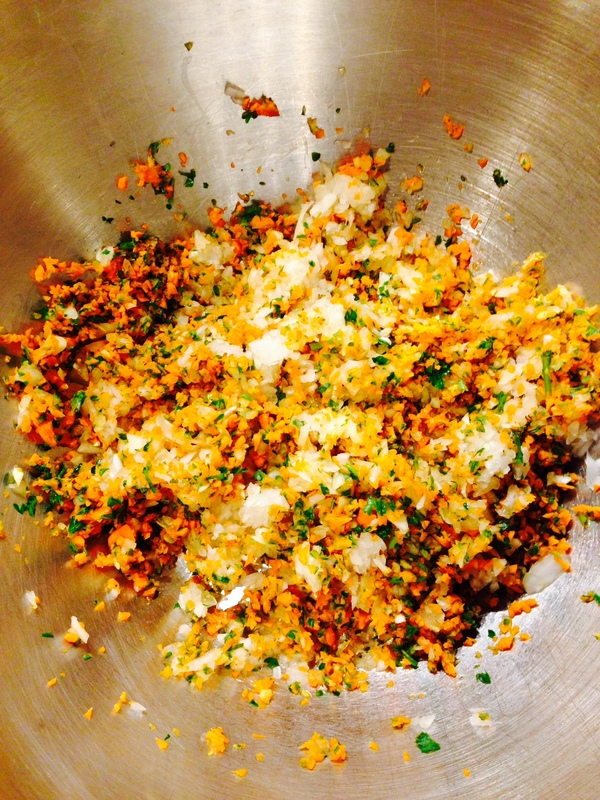 More specifically, it shows tiny pieces of carrot, garlic, onion, and parsley. 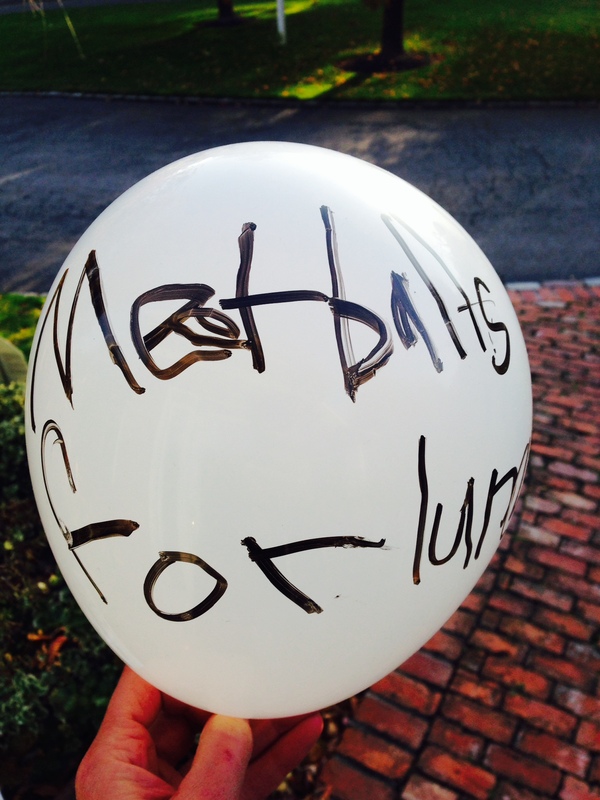 I, like many parents, at least the kind of over-the-top parents I hang around, use meatballs as a vessel for veggies. Martin loves when I send meatballs to school for his lunch. He finds many ways to tell me how much he loves when I send meatballs to school for his lunch. 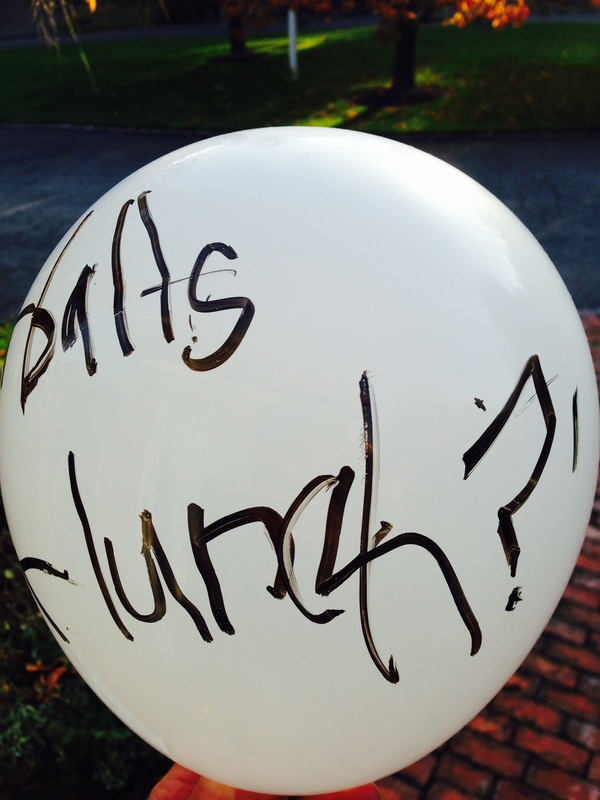 For example, last night after his bedtime, I returned to the family room to find that he’d written “MEATBALLS FOR LUNCH?” on a balloon and left it on the toy chest. If nothing else, he’s subtle. So meatballs it is. But I shall insist on concealing veggies in those meatballs. I process onions, fresh garlic, and whatever else I have on hand, then mix them with ground beef, maybe a 1:1 veggie-meat ratio, or slightly less. Then I form the mass into balls and store them in a glass container. For the next three mornings, I will cook meatballs in olive oil, add strained tomatoes (from a glass jar), and pack them, hot, in a stainless-steel container for Martin to take to school. 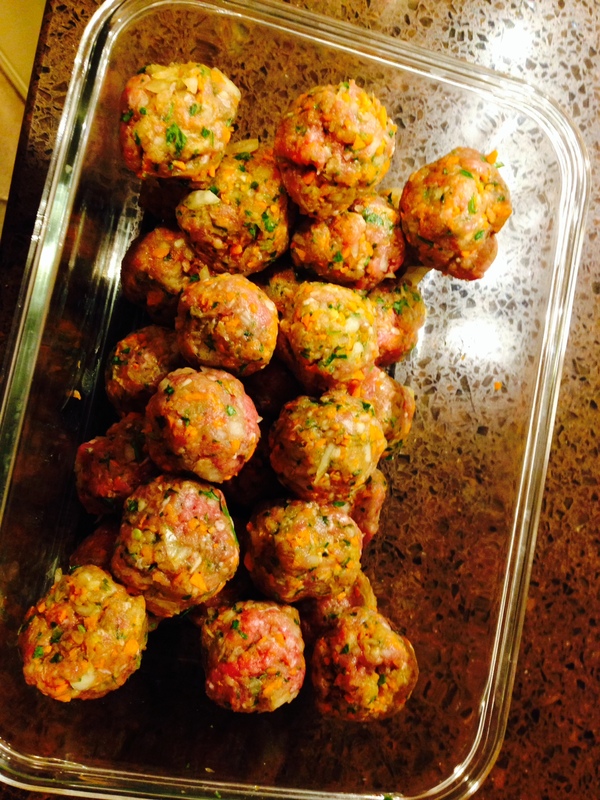 (I also fill the container with near-boiling water for five minutes, then empty the water and add the meatballs. This helps keep them warm.) As I mentioned on October 29 (see the paragraph numbered (3. ), which begins, “I’m an empiricist”), I have Martin down to one serving of meat daily, not counting bone broths. For the next three days, the meat serving will be meatballs at lunch, and I’ll be happy to think I’ve snuck in almost the equivalent of a side salad. If I could find a way to keep the veggies raw while cooking the meat, they would be more salad-like still. Time for a confession: Martin’s not the only one getting fooled these days. Although Martin has been gluten-free for almost four years now, I’ve never made our household gluten-free. I like bread, and occasional seitan. Adrian likes to take a sandwich to work each day, along with crackers for his hummus or raw-milk (over the top!) cheese. This summer, after reading a few opinions and reviewing my own experience, I became more concerned about cross-contamination between our gluten-containing products and Martin’s foods. Although I have separate toasters for gluten and gluten-free bread, they both leave residue in the cabinet. Although I wash the cutting boards between uses, it’s not like I never find a few bread bits clinging to the edges. Crumbs are untamable. They fly everywhere! Cheese and yogurt, the two dairy products that Adrian likes, so we have them at home, are much easier to subdue. I knew I should make our house gluten-free. I also knew that I’d be pushing it with Adrian if I told him my plan. Adrian is super-duper supportive about what we do for Martin. That being said, Adrian works long, tough hours and hates to have his little pleasures denied. I can see his point, or the point he would have made had I told him that the house should be gluten-free: How necessary is that? Is it too much to ask that I take a sandwich to work as part of my lunch? That I have toast with weekend breakfast? Enjoy a plate of cheese and crackers and grapes when I come home late? So I did what any sensible autism-recovery mom would do: I kept my mouth shut. 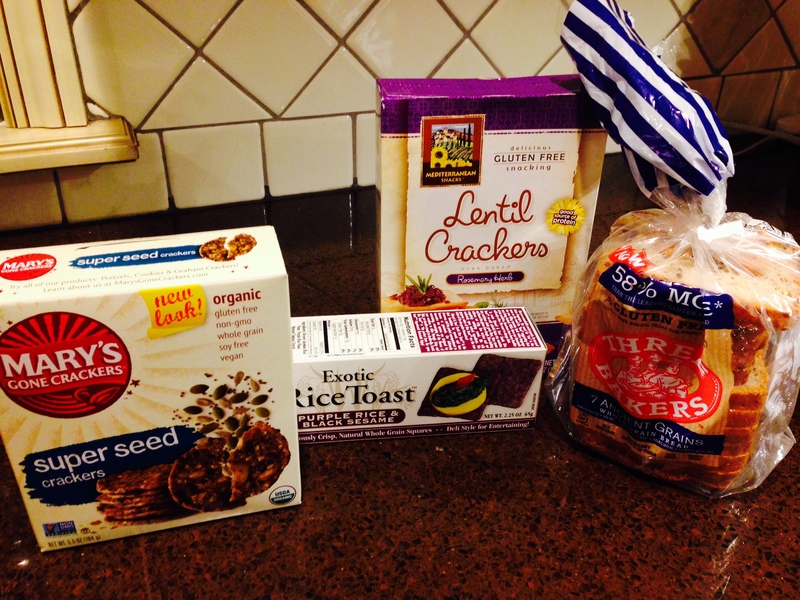 Over a couple months, I searched for the best tasting gluten-free products that I could substitute without Adrian realizing. Crackers were easy; he’s always liked good-quality rice-, quinoa-, and seed-based crackers. The challenge was bread; most varieties I found were crumbly, or dry and nutty tasting, or both. (The chicken-and-egg bread I make for Martin is not an option, because Adrian doesn’t eat chicken.) Finally I found a variety at my local Stop & Shop that is almost indistinguishable from gluten bread. It is less dense and the slices are smaller. Other than that, hard to tell. It’s been more than a month since I’ve brought gluten into the house. If he’s noticed, Adrian hasn’t said anything. Wait! you might say. This post has just gone public. Isn’t Adrian about to discover his unwitting gluten-free lifestyle? He doesn’t read my blog every day. Two of these products (I won’t say which two) are more processed and full of ingredients that would never be in my kitchen if I were baking. The other two are pretty good, and products that I would consider for Martin if he weren’t on the GAPS diet. Adrian is getting all of these. He can take it. This entry was posted in Diet and tagged ASD, autism, bread, cooking, crackers, gaps, gluten, gluten-free, meatballs, recovery by findingmykid. Bookmark the permalink.